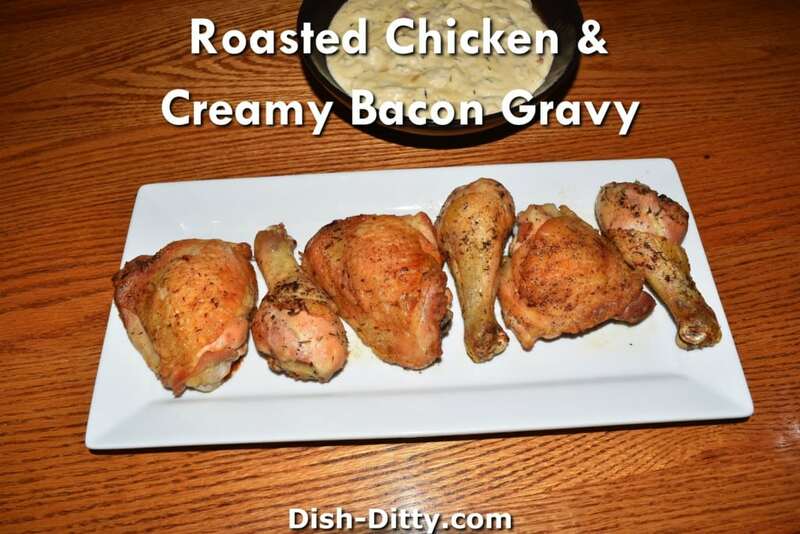 This Roasted Chicken & Creamy Bacon Gravy Recipe is a hearty meal that works great on a weeknight and is perfect for guests as they can eat the chicken with or without the gravy. When I made this recipe, I had the large picnic pack of chicken. You can just use a 6 piece chicken pack and reduce the gravy ingredients by half. If you don’t want to use the cream of mushroom soup, you can opt to add in fresh mushrooms with the onions and add extra salt. Preheat oven on roast setting to 375 degrees F.
Cook the bacon in a large chicken fryer pan until crispy. Remove from pan and place on paper towels to drain off excess oil. Sprinkle the chicken pieces with garlic salt, pepper and thyme. Brown chicken in batches using the bacon grease. Place cooked chicken on a cookie sheet lined with tin foil that has been sprayed with olive oil cooking spray. Roast chicken in the oven for 20 minutes, or until chicken thighs reach 165 degrees. 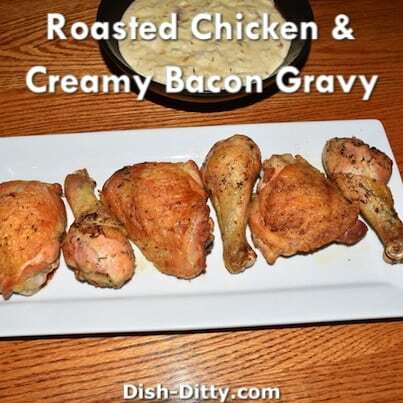 While chicken is cooking in the oven, make the gravy. Remove all but 1-2 tablespoons of the bacon grease. Add in 1 tablespoon of butter and cook onion in butter/bacon for about 2-3 minutes, or until onion starts to soften but is not browned. Add the vermouth and cook until it is reduced by half. Add back the bacon, 1 tsp thyme, and flour. Cook for 2-3 minutes, stirring constantly. Add the chicken broth and cook for 2 minutes. Add the sour cream and cream of mushroom soup. Cook stirring constantly until mixture just comes to a boil. Remove the sauce from heat and serve with the cooked chicken. 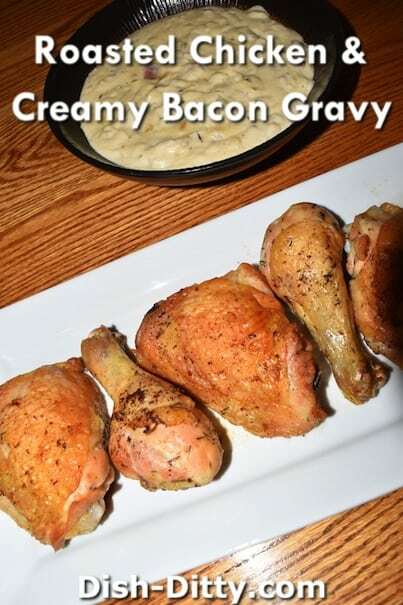 No Replies to "Roasted Chicken & Creamy Bacon Gravy Recipe"